and that’s it. 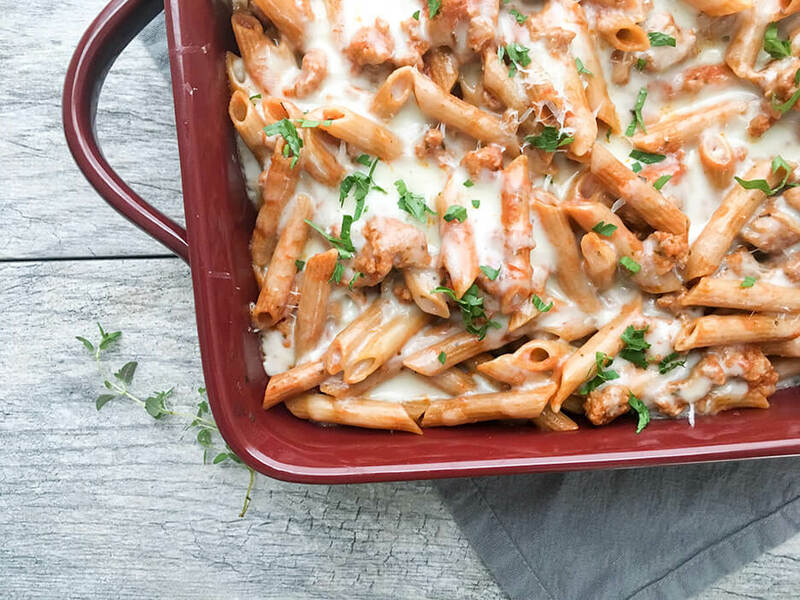 This 5 ingredient Baked Ziti with Ground Turkey is a pure winner. I often pair it with a fresh green salad drizzled with a light vinaigrette dressing for a complete and satisfying meal. Honestly, it’s not only easy to prepare but it has other advantages such as making for great left-overs, being kid-friendly, very economical, and clean-up is a cinch. Ground turkey is a very lean meat and as a result I always add 1 to 2 tablespoons of extra virgin olive oil to the saute/frying pan before I begin browning the meat. Always cook your pasta noodles until they are al dente since the baked ziti will bake in the oven. You do not want your pasta noodles to become over-cooked. You do not have to opt for penne; however, I would recommend a pasta noodles that is more hearty and not as delicate as a heartier noodle will hold up better in my opinion. If you are straying away from refined or white pasta, go for whole grain or whole wheat as a healthier option. Be mindful of the sauce to pasta ratio as you do not want your pasta to absorb all of your tomato-based sauce which could result in a dry pasta dish which you definitely do not want. I really hope you enjoy Baked Ziti with Ground Turkey. What’s one of your go-to pasta dishes when time is of the essence? I’d love to hear from you. If you’re a fan of quick and simple pasta dishes check out my Ground Turkey Lasagna Rolls. 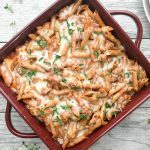 This Baked Ziti with Ground Turkey is as simple as gathering 5 key ingredients and putting them all together to create a dish that's simple yet healthy and robust. Prepare a baking dish by rubbing a little butter around the inside of the dish to prevent any sticking. In a saute pan over medium high heat, add olive olive. When oil is hot, add ground turkey. Season with salt and pepper. Continue to brown turkey until no longer pink. Open a jar of your favorite pasta or marinara sauce and add to browned turkey. Add a dash of salt and minced garlic (optional). Taste sauce to make sure it is seasoned to your liking. Add wine and cook until alcohol has burned off and taste test again. If sauce is too thick for your taste, add a little pasta water to loosen the sauce. Add pasta to sauce and stir until combined (be sure to pay attention to the pasta/sauce ratio). Pour into your prepared baking dish. Layer the top with grated cheese. 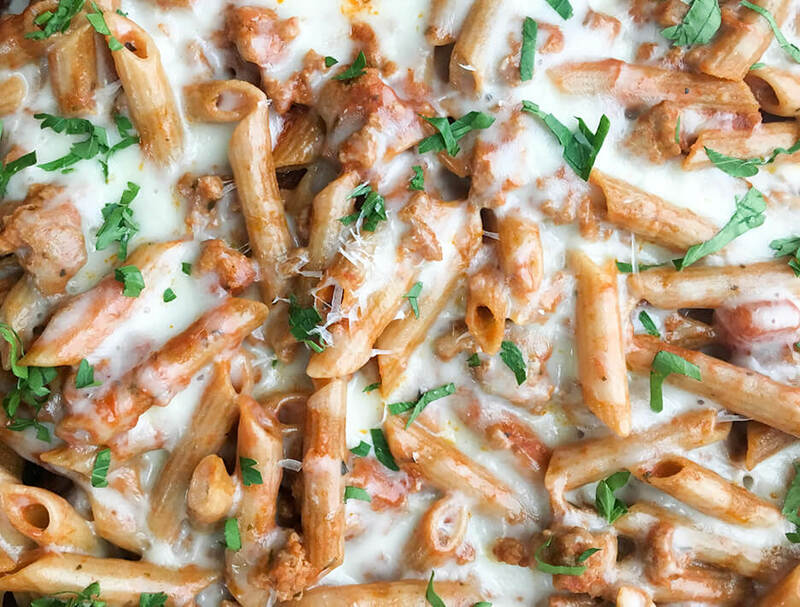 Place foil over the baked ziti and bake in the oven until cheese is melted and gooey. If you like the top to be slightly browned, remove the foil and continue baking for a few extra minutes until the top is slightly browned. Sprinkle the top with parm and chopped parsley (optional). What temperature should I use in the stove?! Hi Lucy – Preheat your oven to 400 degrees.